The theme for the August Craft Along with GIY is Food and Beverage. For my project, I made a skirt with Michael Miller Goth Cupcakes fabric. I used my go-to skirt pattern Simplicity 2449. I made the skirt out of black broadcloth and added a border of the cupcakes fabric. To finish, I stitched purple grosgrain ribbon along the top and bottom of the border. Bad photo because (1) I had a 12-hour workday and I'm feeling wilted and (2) there's no good place to take pictures among the in disarray caused by the flooring issues. But I wanted to post on time. I'll get a better photo later. Vanilla or cinnamon. I usually buy vanilla because cinnamon/apple cinnamon candles are almost always red, and red clashes with my decor. Encyclopedia. I have always loved to read about all sorts of topics. 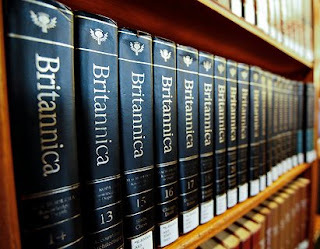 Pre-internet, the encyclopedia was THE source for information. 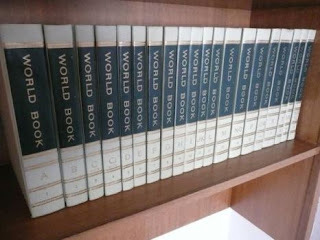 In my youth, I read more than one set almost in their entirety (skipping the occasional uninteresting topic). What is your favorite brand and color of lipstick? Eons ago, it was Urban Decay's "Plague" because it perfectly matched my purple hair. These days, I don't often wear lipstick. I don't use it. I am extremely sensitive to perfumes. If you had to give up the color black, what color would you choose instead? Gray. I love purple, but if I replaced everything black with purple, my wardrobe and house would be an unsettling riot of color. If you could change your name to a stereotypical 90s/2000s gothy name, what would it be? What are your top three tips for surviving hot weather while black clad? (1) Stay out of the sun. Clothing color doesn't really matter if you're not in the sun. (2) Wear loose clothing made of natural fibers such as cotton or linen. (3) Carry a frozen bottle of water. Cold on your palms or wrists will cool you, and as the ice melts, you’ll have cold water to drink. What song will always make you happy (doesn’t have to be a goth band)? Are you active in the arts (ex. Play an instrument, paint, write, etc)? If you had a teacup or mug made inscribed just for you, what would you have it say? I wouldn't have any use for a teacup or mug. I need a black t-shirt that says "Do not place in direct sunlight." What is your number one non-gothy hobby? 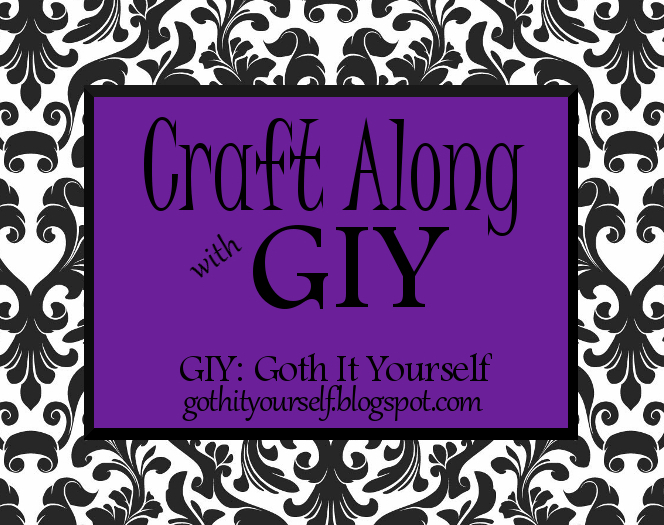 What is a gothy hobby? Building coffins? Collecting Bauhaus memorabilia? 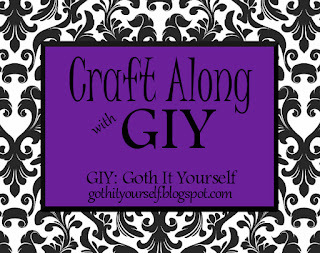 ;) My hobbies - sewing, crafting, DIY - aren't intrinsically gothy, but they usually end up with gothy elements. If you could be a supernatural creature, what would it be and why? A shapeshifter because of the new experiences I could have, such as flying as a bat and breathing underwater as a dolphin. What horror monster-based super power would you have? Do you feel confident or comfortable interacting with other Goths or gothy people (online or irl)? Why or why not? I don't feel confident interacting with people, gothy or not. I'm extremely introverted, and social skills do not come naturally to me. Which is more important for a look: Great hair or great makeup? I think either one can make or break a look, depending on the circumstances. For myself, I focus on hair because while I can often achieve good hair, no amount of makeup can make me like my face. Is there something you wish there was more of in your subculture? Daytime social events with a specific activity, such as crafting or playing cards/games. As an introvert, I am stressed out and miserable at parties where people show up to simply talk to each other. Care to share an embarrassing story related to your “darkliness“? I don’t recall any embarrassment specifically related to my dark tendencies. I have unintentionally caused other people to embarrass themselves. (1) During the brief time I had bright red hair, a nice older lady complimented me on my Raggedy Ann costume. She was mortified when I politely told her it wasn’t a costume. (I decided red hair might not be the best idea if I was going to continue wearing striped tights almost daily.) ;) (2) At a mall food court, a boy was staring at me so intently that he bumped into a trash can and his whole tray of newly purchased food dropped right in. How are you at DIY? My first instinct is to say, "Not bad" because I never think I'm great at anything. But if I evaluate myself more objectively... I have rocked some fairly complicated DIY projects. I love watching cheesy romance films. False. My heart has been burned into a lump of charcoal, and romance is too great a suspension of disbelief. I ALWAYS remember to wash off my makeup at night. False. My entire plushies collection consists of two bats and one dragon, all gifts from coworkers, which I keep in my cubicle at work. I wear non-black pajamas most nights. False. My sleepwear is usually a black cotton knit t-shirt-style dress. False, if referring to a goth club. True and false. The statuary and history can be interesting, but the concept of burial makes me uncomfortable. I’d sooner faint than pet a spider. False. I don’t mind spiders. The silk annoys me more than the spiders. I swear if there is a strand of spider silk within 10 miles, I will walk into it. I don’t like haunted houses. True, if referring to the "entertaining" type set up around Halloween. I do not enjoy blood and gore, and I absolutely HATE being startled. Just checking in with a reminder about this month's craft-along. :) I'm working on a sewing project. Keeping with the Food and Beverage theme, I am using this fun "goth cupcakes" fabric. Want to craft along? Details HERE. I spent the morning driving 75 screws into my subflooring. There was no appreciable difference in the creaking. 75 screws and IT STILL CREAKS. I am so frustrated! I don't know what else to do except have the subflooring replaced. It will be at least two weeks before I can do that because I have meetings and events at work. So I get to live with bare plywood floors while my lovely new flooring sits in boxes. UGH. The silver lining is my new washer and dryer are working well. I have been catching up on laundry while pulling up the old flooring. All this activity has traumatized my fearful little dog Nook. She is scared of the new sounds coming from the laundry closet, and she is scared of the new floor. I carried her outside to go potty, and she wouldn't come back in the house. I had to carry her inside. I set her down on a rug, and she wouldn't leave the safety of her "island." Nook does not handle change well. New = terrifying. And lest anyone worry... no, I didn't leave her stranded there. After I took the picture, I carried her into the bedroom, where everything is reassuringly unchanged. She is once again ensconced in her nook, where she feels safe. It's a Bats in the Belfry graphic t-shirt from Redbubble. I was hesitant to order it because the front panel is polyester, and I'm a cotton gal. But the back and sleeves are cotton, so I took a chance. I'm glad I did because I love the shirt! The front panel is very soft; none of the stiffness that you sometimes get with printed t-shirts. The shirt is a typical men's/unisex straight shape, but the slim fit keeps it from looking horribly boxy. Ordering from Redbubble was easy, and shipping was pretty fast. They have a plethora of different bat designs, and I'm sure I will order from them again. I wanted to show the final result of dyeing my regrowth, but I cannot get a picture to accurately depict the color. No matter what I try, no matter which settings I use, my camera INSISTS on making my hair look blue. Tonight's project is dyeing my regrowth, and the post-bleach result is pastel silliness. I've been successful at dyeing my bangs purple. :) Though my natural color is a medium/dark brown, it bleaches out easily. Bleach with 20 volume developer takes it to yellow in 15-20 minutes. 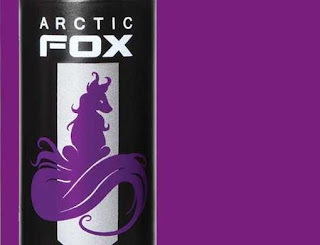 And I'm closing in on a dye that produces the shade of purple I want. 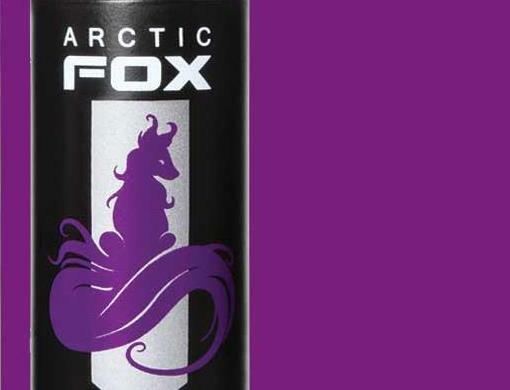 Arctic Fox Purple Rain is just about the right color. Most of my hair is still black. After the series of salon disasters, I have given up on changing it to purple. I think I'm going to wait until the regrowth is a few inches, and then try for a purple/black ombre. I usually wait until a project is finished before posting about it. That means more substantive posts, but fewer of them. Would you be interested in in-progress posts? Would you want to see them here on the blog, or on Instagram with the finished project on the blog? And a photo frame from the dollar store. I removed the back and the glass from the photo frame. Using acrylic craft paint, I painted the frame black and set it aside to dry. I centered the back on top of the box lid and traced around it with a pencil. Following the pencil lines, I cut out the rectangle from the box lid. I turned the lid over bottom side up. To cover the hole, I used a piece of black lace. I duct taped it into place. Duct tape isn't very classy, but it's MUCH easier than trying to glue lace. I turned the lid back over so the top side was up. I added the frame. It has little metal tabs which one would normally bend inward to hold the back in the frame. I bent them outward instead, and they worked perfectly to hold the frame in the opening. Then I turned my attention to the box itself. The box was shallower than the subwoofer. This wasn't really a problem, though, as I didn't need to enclose the entire subwoofer. I simply cut a hole in the bottom of the box large enough for it fit through. I slid the box over the subwoofer with the box's bottom toward the back and the top toward the front. And placed the lid on the box. The router generates some heat, so I did not want to enclose it in a cardboard box. 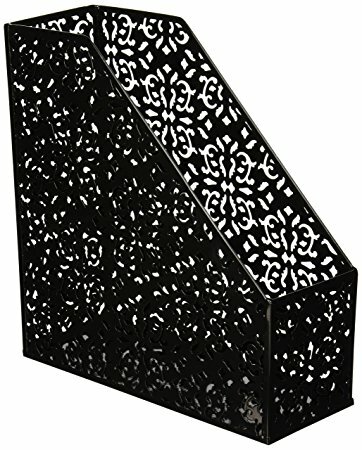 Instead, I placed it in a magazine holder made of filigree metal. I turned the holder backward so the tall "front" hides the router while the much shorter "back" allows the cords to exit. I used a second magazine holder for the modem. 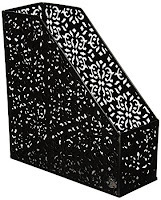 For the speakers, I made covers that double as candle holders (details HERE). The disguises were complete! After looking at the pictures... I think I'll shift things so the box is in the center with a magazine holder on either side. I like symmetry. I made the change. Symmetry! I've been looking for a (relatively) realistic model crow or raven for ages. What I found were lightweight (foam?) bird-like shapes with glued-on feathers... and glue on the feathers. Big globs of glue. I wasn't expecting heirloom quality, but these looked super cheap. My luck finally changed! 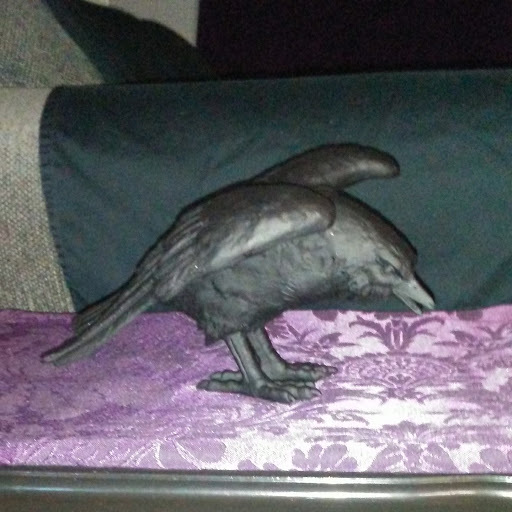 I was thrilled to find decent model crows at Michael's. They are approximately life size, and there are two poses - one with wings folded, one with wings extended. I bought the latter and I think I'll go back for the other. I don't see them on Michael's website, so they may be in-store only. The cost was $14, I think; I paid half thanks to a 50% off coupon. Also... I've had several people ask me where I got my spooky tree with purple LEDs. Michael's currently has a nearly identical tree in store now. It's actually even better because it has bats! :D It's $90, but you can get a 50% off coupon from Michael's website. During August, I will work on a craft project for the monthly theme. Around August 29, I will post my completed project. You can share a link to your project on that post or at any time during the month on this post. 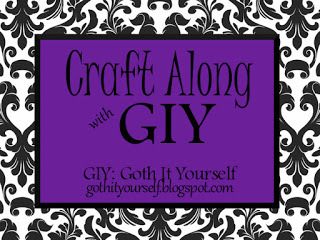 On August 31, I will compile the links on the Craft Along with GIY page. Or anything else related to food or beverage. Creativity is encouraged!